BadCatDesigns: Showing off my grandchildren! Here I am today, just like a proud grandmother seeing her new grandchildren for the first time. Several people have finished my Veil of Isis and Saigon designs, and I collected some pictures for you to share. It gives me a large amount of pleasure to see my designs crafted so well by these skilled knitters, and I hope you enjoy them as I am. The next Isis is from Jane VanDenburg. 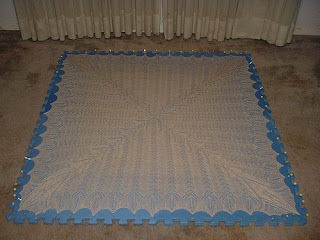 She used Alpaca/Merino yarn. I love the contrast in her photograph. The next two pictures show Susanna's Isis. 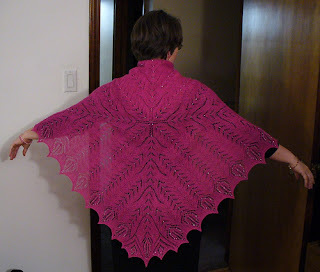 She used Malabrigo Lace, and the color variation works very well. I wish I could wrap myself up in those purples. These are Susanna's guys, from left to right, Solomon, Zachary, and Nicholas. 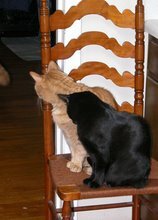 They are visiting with LucyFur in a virtual way today. Such a content looking trio, eh? 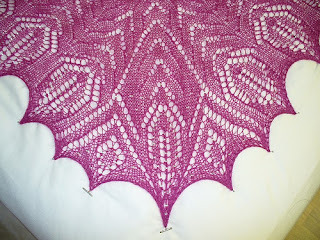 The next picture is from Susie, who knit Isis using KnitPicks Alpaca Cloud yarn. More beautiful work from Susie... I would like to mention that Susie made an extended chart for Isis and many people have praised it. You can find her chart in the files section of my Yahoogroup. 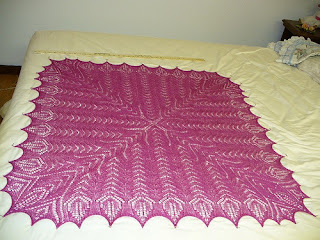 Last, but certainly not least, Judith Gilbert sent me this picture of her Saigon Scarf, still on the needles. I would like to wrap up in this one too! 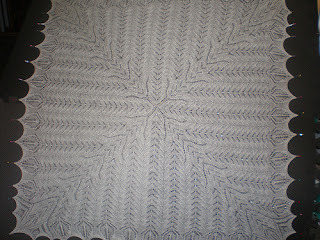 I will be back with a look at what is on my needles, and some fine show-and-tell, later in the week. Until that time, knit on! Wow! You are not only talented, but you clearly have talented grandchildren too! They are all lovely, thanks in part to your brilliant design! I still intend to dye that particular grand kiddy, I just can't pick a colour, and the way i want to dye is posing problems for me mentally! Nothing new there, just getting up in the morning seems to pose mental challenges to me at this time of year. Nice to see all the Isis though, it's always wonderful how individual everybody makes them. 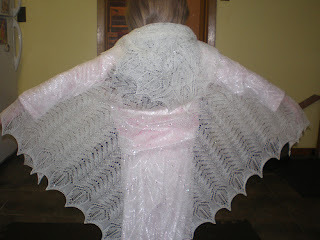 Thanks for the great pattern though Andrea, it was a sheer pleasure to knit. 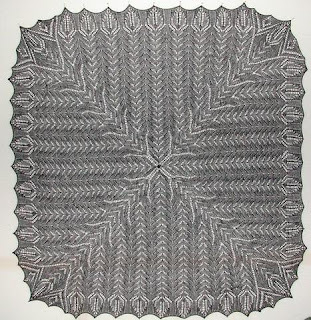 This is a beautiful shawl. Iwould love to knit it. How do I get the pattern? You didn't leave me any way to contact you, so here is my reply! The pattern is right here on my blog. Just follow the link under the post (Isis.) You will find the entire pattern along with notes. What a stunning pattern! I have so many in the queue, but am sorely tempted... :-) It's nice of you to show the wonderful interpretations in all their variety as well!